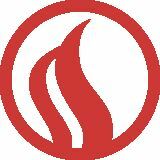 We have it all Skytech has been a recognized leader in fireplace remote systems for more than 20 years and is synonymous with bold innovations, rock solid reliability and unrivaled customer support. Thatâ&#x20AC;&#x2122;s why, when the hearth industry needs something done right the first time, they look no further than the experts at Skytech. If you replace your existing fireplace wall switch with our receiver combined with our uniquely designed wall plate, you will connect your existing low voltage wires to the receiver. If you ever need any help or have any questions, we are available by phone Monday through Friday. Call 855.498.8324. In most fireplaces, the components that you need to connect to are in a space located underneath the firebox and behind the louver. You can either place the receiver underneath the firebox or at your existing wall switch location. Our transmitter will communicate with the receiver up to 25 feet away, over a wireless Radio Frequency (RF) signal. Underneath the fireplace, you will find a valve that will have these three terminals on it: TP/TH, TP, and TH. The receiver wires will connect to the TP/TH and the TH terminals. For IPI Systems, connect the receiver wires to the on/off switch wires. BATTERY RECEIVER Operates on 4-AA batteries. Able to place your receiver in any location away from an outlet. 110VAC RECEIVER All the same functionality as the battery powered receiver. No need to replace batteries. REMOTE READY! C O N T for R O more L SY STEMS See a sales associate information. C O N T for R O more L SY STEMS See a sales associate information. If you ever need any help or have any questions, we are available by phone Monday through Friday. Call 855.498.8324. 1 Year limited warranty on all valve systems. Any remote included has a 5 year limited warranty. The AF-LMF series is a standing Pilot valve kit This AF-LMF is the base model, but you are able to upgrade the AF-LMF to suit your personal needs with our convenient UPGRADE KITS. You can either purchase the different packages that we offer in this catalog, or you can buy them individually. It’s completely up to you how you want to customize your valve kit. The AF-LMF-RVS is not made up of individual parts. Used to convert AF-LMF series valve kit from Natural Gas (NG) to Liquid Propane (LP). WARRANTY 1 Year limited warranty on all valve systems. Any remote included has a 5 year limited warranty. Hinged top provides easy access for battery changes and service. A retail point of purchase display for all of the glass that Firegear has to offer. The POP display holds up to thirty-five (35) bags of glass. GLASS INCLUDED. Spinning display with twenty (20) glass cylinders. 13 inches tall x 10 inches in diameter. MAP POLICY Skytech Products Group-Retail includes Skytech Control Systems and Firegear Outdoors (jointly refered to as “SPG-Retail”). Both divisions have developed a Minimum Advertised Pricing (MAP) policy (the “Policy”) for all products sold by and purchased from SPGRetail and through traditional and/or online retailers (“Products”). In an effort to protect the image and value of SPG-Retail products and to maintain fair and equitable promotional and sales activity among its distributors, dealers, retailers and other resellers (each, a “Retailer”), SPG-Retail has developed the MAP Policy effective immediately. The MAP Policy and its terms and conditions are as follows: POLICY Subject to certain exceptions set forth below, no Retailer shall, at any time, advertise or promote any SPG-Retail Products for sale or resale at a price lower than the MAP pricing established by SPG-Retail for such Products. APPLICATION The MAP Policy shall apply to all promotions and/or advertisements of any Products purchased from SPG-Retail that appear in any media form, including, without limitation, written or electronic flyers, posters, coupons, mailers, inserts, newspapers, magazines, catalogs, mail order catalogs, Internet, online, or similar electronic media, websites, email newsletters, email solicitations, television, radio, and/ or public signage. The MAP Policy shall not apply to (a) any in-store advertising displayed by a Retailer, in-store displays, point-of-sale signs, hang tags or bar codes, or similar product price packaging which merely state the price of such product; (b) the promotion or advertisement of discontinued Product, so long as such Product is clearly marked as discontinued within said advertisement or promotion; and (c) the actual price at which any Products are sold to an individual consumer at or from a Retailer’s physical location or via telephone. OTHER TERMS AND CONDITIONS MAP pricing is subject to change from time to time at the sole discretion of SPG-Retail and can be accessed by contacting SPG-Retail Divisions at (888) 672-8929, or by written request via email at info@skytechpg.com. It shall be the responsibility of all Retailers to remain current as to MAP Policy, pricing, and any changes thereto. The MAP Policy shall apply to all Products sold to SPG-Retail distributors and resold thereby to any Internet or online dealers and retailers, and such distributors shall take all necessary steps to enforce the MAP Policy in connection with each and every such resale. By accepting Products from SPG-Retail and in consideration of continued access to Products and the benefits realized as an SPGRetail preferred, approved Retailer, each Retailer accepts and all Products they purchase from SPG-Retail shall be and remain subject to the MAP Policy as set forth herein. Should it be determined that any Product subject to the MAP Policy is or has been advertised or promoted at a price below the MAP pricing established for said Product by SPG- Retail at any time, the violating Retailer shall immediately take all steps necessary to cure said violation and bring its advertising, promotion, pricing and sales activity into compliance with the MAP Policy. SPG-Retail hereby, at any time, reserves the right to discontinue the shipment of Products to the violating Retailer and/or its distributor, and the right to terminate future sales of Products to said violating Retailer and/or its distributor, subject to the parties’ respective financial and confidential obligations that shall survive such termination. WARRANTY POLICY Skytech Remote Control Warranty Replacement Policy We understand that with our 5-year limited warranty products can sometimes fail whether they are new or still under warranty. However in order for us to provide the best possible service to you our policy is as follows: If you feel you have a defective Skytech Remote Control and it is under warranty, that part must be returned to us for evaluation before a replacement will be sent. We will request you to send the product to us for evaluation providing us with your name, address, telephone number and short description of what is wrong with your remote. At the same time, if the remote is under warranty we request a copy or original receipt of date of purchase to ensure we can cover it under the warranty. In some cases we may assign you a Returned Materials Allocation (RMA) number. Once the evaluation has been conducted, if we find the remote control defective or it can be reworked we will send you a new replacement or your fully functioning original remote back to you at no charge. If you cannot wait for the replacement part to be evaluated due to time constraints or certain situations you have the option to purchase a new remote. If you wish to have that replacement part expedited you will be charged for the shipping costs incurred. Our Skytech Technical Support telephone line is 855.498.8324. If you have questions or concerns about the operation of your remote control please feel free to call us anytime between 8:00AM – 5:00PM EST. ONLINE TOOLS We strive to help our dealers and distributor be as informed as possible about our products. If you go our website you will find all of our instruction manuals for each individual product as well as helpful technical & customer service videos. Check back often as we are always adding and updating our catalog of online tools. 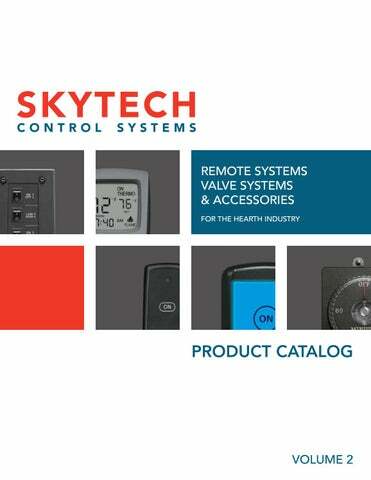 Remote systems, valve systems and accessories for the hearth industry.